Screenshot, possibly a photo taken of the CRT monitor. 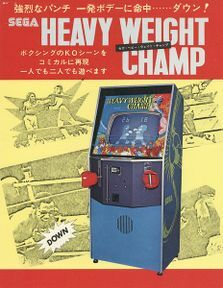 Heavyweight Champ was an arcade game released worldwide in 1976 by Sega, this game was noteworthy for being regarded as the first game in the "fighting" genre. The arcade machine had one boxing glove for both players protruding from it that acted loosely like a joystick. 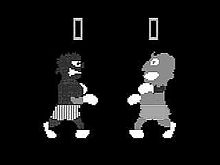 The arcade game itself featured monochrome graphics with two similar looking characters on opposite ends. The joystick-like controllers that would perform a different move depending on what direction the stick was moved. The game was remade in 1987 which proved to be popular, thus overshadowing the original into obscurity. 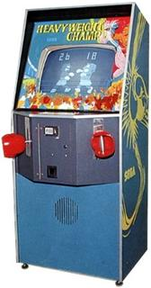 There is no footage of the game in action online and for a time, no known instance of a surviving cabinet. However, a thread was started on the forums of K.L.O.V. (Killer List of Video Games) on February 13th, 2018 looking for information about the game, in which a photo of a cabinet (albeit with a smashed glass bezel) surfaced. This photo supposedly originated from a Yahoo Japan Auction page, but no source was given nor was any info was given on the cabinet's functional condition. Though it appears to have suffered some signs of exposure and possible weather damage and is thus likely not in working order. While the whereabouts of this particular machine are unknown, it does mean that there is potentially at least one cabinet still in existence. Picture of the arcade cabinet. Flyer for the arcade cabinet. 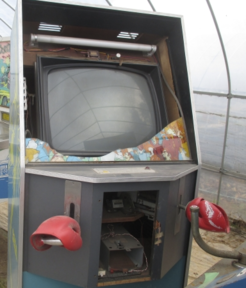 Photo of damaged machine from Yahoo Japan Auction.